I hope you are all having a wonderful Good Friday. I had to work, but it was relatively slow and I got to get some things done before bugging out a little bit early. I stopped by Total Wine on the way home and picked up a great sixer (I hope). This old dude in line was complaining to the cashier that he couldn't find the Budweiser (like they need this extra publicity), and while it completely stopped the line, she managed to page someone to get it for him and two other cashiers came to the line rescue. Nice job! Anyone watching the Masters too? I always feel great when Tiger Woods and Phil Mickelson are not on the leaderboard, so them being down 7 and 10 shots, respectively, gives me another reason to celebrate (did you already forget the first reason is Good Friday?) Personally, I am a novice golfer, but don't make a fool of myself on the course. It's the one sport that I feel takes such different skills that it can frustrate even the best all-around athlete. Anyone agree or disagree with that? 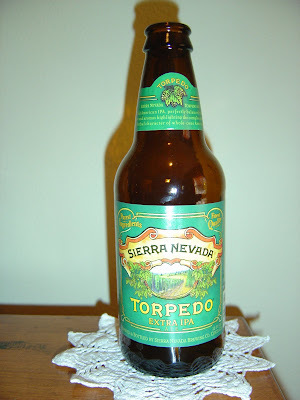 Sierra Nevada Torpedo Extra IPA brewed by Sierra Nevada Brewing Co. in Chico, California seems like a good choice to get things rolling. I've had some weak IPA's this past week, and I'm really begging to reverse course now. Now that's what I'm talking about. In your face hops aroma, perfect. Some lesser floral and citrus scents too. The flavor is outstanding. You can taste grapefruit and the hops give it a good bitter bite. The flavors evolve and last on your palate and provide a nice warm and spicy burn. Carbonation and 7.2% alcohol content are balanced beautifully for a terrific experience. If you love hops, this is your beer! Go for it! Don't Catholics eat bread on Good Friday? I mean, I understand communion (so let's skip that comment) but is there something special about it tonight? What I'm getting at is... does liquid bread count?